Back in the late '80s, when yours truly was a tyke and Boglins could still be found resting their lovably ugly mugs on toy store shelves, I got the little guy pictured above. At Toys R Us, I believe. I remember wanting a Boglin so badly--and at some point I did get one of the standard rubbery hand puppet varieties as well--but I think I liked this mini caged Boglin just as much as I liked the real deal. Now, this one's a bit of a mystery. Obviously, it's not a regular larger Boglin, but it's not one of the monochromatic Mini Boglins that were sold in the U.K., either. Instead, it's slightly larger than a Mini Boglin and made of a less rubbery plastic, plus has articulated arms and painted details. Its markings include a few different names, including Arco, Seven Towns Ltd., and Clarke, Trotto and Mass. There has been speculation that it may not even be a Boglin at all, as you can see in this thread I posted about him over at LittleRubberGuys.com. Personally, I'd put money on it being an official Boglins item, since it looks exactly like a Boglin and I have a vague memory of it being sold as such (for some reason I kind of remember the name "Pet Boglin," but it's totally possible I could just be making that up). Beyond that, I couldn't tell you exactly what the particular line of these caged Boglins was named, or how many different figures it included. Speaking of caged, that's part of what makes this guy so cool. 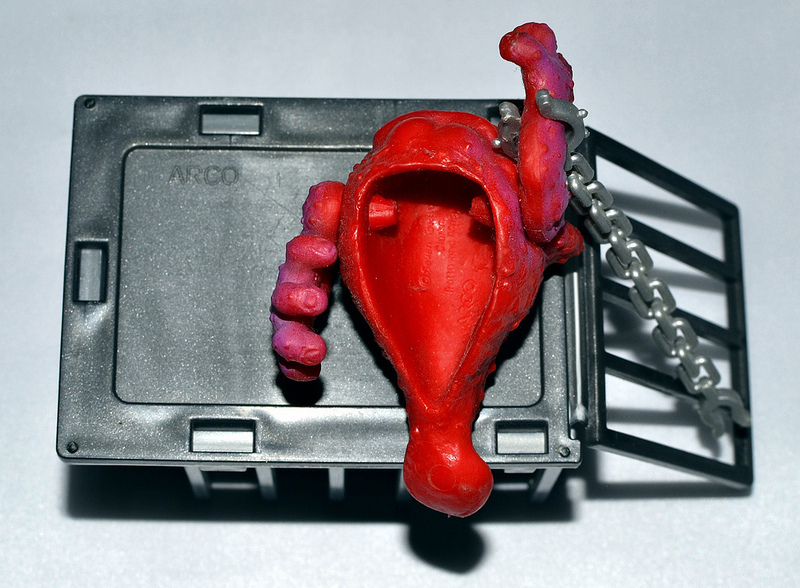 How great is it that he comes with a chain and a little plastic cage that snaps shut, so you can keep him contained from wreaking havoc when you have your back turned? I also love the expression mine has. He sort of looks dazed and confused. And that's about the extent of my knowledge about this toy. I'd love to find out more details about the line. I'd especially like to see a packaged example of one of these Boglins. Have any of you out there ever encountered a Boglin of this variety? I think this is one of the later varieties, but I can't remember what series it was from. They did produce a lot. I remember large, small, soggy, hairy, baby, baby glow, action, light & sound, micro and mini. Plus there were some Hallowe'en ones but I never saw those in the shops. Ah, possibly a Micro Boglin? Hopefully a packaged example will turn up at some point. Thanks for sharing, I love this guy. Boglins were so great. How awesome would it be to have like a dozen of these in the cages and stack them up like some kind of Boglin pound. That would be awesome. I wonder how many different kinds of this type they made. I haven't been able to find any more info either. I really want one of these suckers! Yeah, it's strange. You would think some of these would have to at least show up on eBay at some point! I have Seven Towns connected with both board games and Cereal premiums here in the UK, so they were probably 'license handlers/managers', while Arco are supposed to be the next/Subsequent 'brand' name by the people who originally imported Hong Kong produced tat under the 'Giant' label into the US, I suspect that they were in fact a budget subsidiary of Mattel, whose (Mattel's) 'Rambo' set they (Arco) issued. Probably set up to try and hide Mattel's involvement in HK tat on the same shelves as - more expensive - Mattel branded stuff in somewhere like T'R'U? Thanks for your comment! I read that Mattel acquired Arco in 1986. Interesting that they'd release Boglin items under two different company names, though. Mattel used Arco as their "budget" subsidiary. I'm pretty sure that the smaller, carded Mad Scientist items are Arco, for instance. I have one of these mini-Boglins somewhere, minus the cage. I think mine's red with green spray, but I could be misremembering. Thanks for the info! I'd love to see a pic of that Boglin you have if you dig him up. Thanks for sharing! This is the first time I am seeing an orange and green version. I was terrified of Boglins as a kid (and if you ever saw the commercial on YouTube you'd see what I mean) so I never owned any until I was like 18-19 years old and discovered eBay. Actually, my online handle is because my friends all called me "Boglin" so I altered the spelling to be "Bah'glenn" instead. Before that, my chilhood friend up the block had this little boglin given to her as a gift by her father when he returned to town from a business trip. Years later it made it's way into my collection from her but minus the little chain and cage. I never knew they made other ones, so seeing that picture with a 2nd one is really awesome. Have any more pictures of these new in the package surfaced yet? Funny! I don't remember ever finding them scary but I'm not sure if I saw the commercial you're talking about. I'll have to go check it out now. I wish I could find my full-sized Boglin from when I was a kid. I know I still have it somewhere. I recently found one of these while going through a bin of my childhood toys. I'm still searching for the cage but I was wondering if anyone knows what something like this is worth or how collectible it is. I was considering giving it to my kids to play with but they would destroy it. As it is now, it's in great shape. My mom wouldn't let me play with it because it was "disgusting". 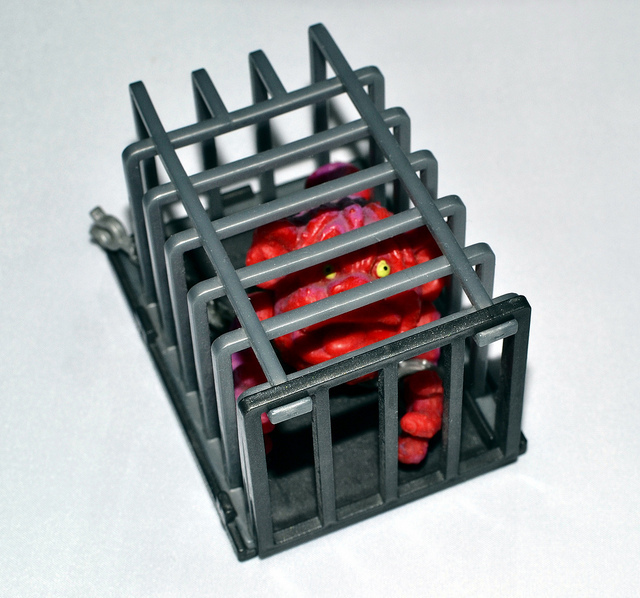 These small, articulated caged Boglins are pretty sought after among Boglin collectors. They don't appear too often. I've received a few different inquiries asking if I'd part with mine (which I declined). I can't really give you a value though because I don't remember actually seeing one sold. Of course, if you find the cage it will be more valuable. I have three of these with cage and chain. All three are different sculpts and different paint. The back of the cards were plain brown, with no info. I got them at Toys R Us as a kid. I had some of these with a sliver cage bottom not black like yours so there's a known variation. I had 3 different sculpts/colors. I recently sold them for $50 apiece so there's some info on pricing.